英文摘要：Mount Emei (EM) and Mount Huangshan (HS) are both famous for the Macaca thibetana ecotourism in China. Study on the composition difference of gut microbiome in M. thibetana from these 2 places will improve our understanding of the effects of habitats and tourism managements on wild primates. In this study, 16S rRNA gene was used as molecular marker to explore the gut microbiome of M. t. thibetana in EM, and M. t. huangshanensis in HS. The result showed that a large number of operational taxonomic units were shared by the gut microbiome of M. thibetana from EM and HS. Remarkably, significant differences were detected in community composition and microbial diversity. The dominant phylum microbial communities in EM were Firmicutes (69.04%±11.81%), Bacteroidetes (21.59%±10.05%) and Actinobacteria (2.73%±2.17%). By contrast, Firmicutes (46.34%±8.15%), Bacteroidetes (36.75%±6.38%) and Proteobacteria (14.91%±8.06%) were the dominant in HS. The most abundant genus in EM was Oscillospira (23.49%±16.63%) and that in HS was Prevotella (36.35%±9.15%). In terms of the community diversity, the α diversity index in HS was significantly lower than EM, and their microbial community structures also had a significant difference. PICRUSt analysis revealed that the enriched KEGG pathways of gut microbiome in EM were lipid metabolism and xenobiotics biodegradation and metabolism. Differently, glycan biosynthesis and metabolism, etc were enriched in HS. In addition, several infectious pathogenic bacteria were found in the gut of EM, and this was probably related to the ecotourism in EM. 蒋学龙, 王应祥, 王歧山. 1996. 藏酋猴的分类与分布[J]. 动物学研究, 17(4): 361-369. 蒋志刚, 江建平, 王跃招, 等. 2016. 中国脊椎动物红色名录[J]. 生物多样性, 24(5): 500-551. 孙丙华, 李进华, 夏东坡, 等. 2010. 比较不同旅游管理模式对短尾猴(Macaca thibetana)分群的影响[J]. 安徽大学学报(自然科学版), 34(5): 104-108. 熊成培. 1984. 短尾猴的生态研究[J]. 兽类学报, 4(1):1-9. 尤硕愚. 2013. 黄山短尾猴食物选择的研究[D]. 合肥: 安徽大学. Backhed F, Ding H, Wang T, et al. 2004. The gut microbiota as an environmental factor that regulates fat storage[J]. Proceedings of the National Academy of Sciences of the United States of America, 101(44): 15718-15723. Berman CM, Li J, Ogawa H, et al. 2007. Primate tourism, range restriction, and infant risk among Macaca thibetana at Mt. Huangshan, China[J]. International Journal of Primatology, 28(5): 1123-1141. Bokulich NA, Subramanian S, Faith JJ, et al. 2013. Quality-filtering vastly improves diversity estimates from Illumina amplicon sequencing[J]. Nature Methods, 10(1): 57-59. Caporaso JG, Kuczynski J, Stombaugh J, et al. 2010. QⅡME allows analysis of high-throughput community sequencing data[J]. Nature Methods, 7(5): 335-336. Clarke SF, Murphy EF, Nilaweera K, et al. 2012. The gut microbiota and its relationship to diet and obesity: new insights[J]. Gut Microbes, 3(3): 186-202. Clayton JB, Vangay P, Huang H, et al. 2016. Captivity humanizes the primate microbiome[J]. Proceedings of the National Academy of Sciences of the United States of America, 113(37): 10376-10381. David LA, Maurice CF, Carmody RN, et al. 2014. Diet rapidly and reproducibly alters the human gut microbiome[J]. Nature, 505(7484): 559-563. Deng P, Swanson KS. 2015. Gut microbiota of humans, dogs and cats: current knowledge and future opportunities and challenges[J]. British Journal of Nutrition, 113(S1): S6-S17. Edgar RC. 2010. Search and clustering orders of magnitude faster than BLAST[J]. Bioinformatics, 26(19): 2460-2461. Edgar RC. 2013. UPARSE: highly accurate OTU sequences from microbial amplicon reads[J]. Nature Methods, 10(10): 996-998. Egert M, De Graaf AA, Smidt H, et al. 2006. Beyond diversity: functional microbiomics of the human colon[J]. Trends in Microbiology, 14(2): 86-91. Filippo CD, Cavalieri D, Paola MD, et al. 2010. Impact of diet in shaping gut microbiota revealed by a comparative study in children from Europe and rural Africa[J]. Proceedings of the National Academy of Sciences of the United States of America, 107(33): 14691-14696. Jindou S, Borovok I, Rincon MT, et al. 2006. Conservation and divergence in cellulosome architecture between two strains of Ruminococcus flavefaciens[J]. Journal of Bacteriology, 188(22): 7971-7976. Karlsson F, Svartstrom O, Belak K, et al. 2013. Occurrence of Treponema spp. in porcine skin ulcers and gingiva[J]. Veterinary Microbiology, 165(3-4): 402-409. Langille MG, Zaneveld J, Caporaso JG, et al. 2013. Predictive functional profiling of microbial communities using 16S rRNA marker gene sequences[J]. Nature Biotechnology, 31(9): 814-821. Long YC, Richardson M. 2008. Macaca thibetana[DB/OL]. (2018-04-20). The IUCN Red List of Threatened Species 2008: e.T12562A3359510. Lozupone C, Lladser ME, Knights D, et al. 2011. UniFrac: an effective distance metric for microbial community comparison[J]. The ISME Journal, 5(2): 169-172. Magoc T, Salzberg SL. 2011. FLASH: fast length adjustment of short reads to improve genome assemblies[J]. Bioinformatics, 27(21): 2957-2963. Matheson MD, Sheeran LK, Li JH, et al. 2006. Tourist impact on Tibetan macaques[J]. Anthrozoos, 19(2): 158-168. Mcdonald D, Price MN, Goodrich J, et al. 2012. An improved Greengenes taxonomy with explicit ranks for ecological and evolutionary analyses of bacteria and archaea[J]. The International Society for Microbial Ecology Journal, 6(3): 610-618. Nuriel-Ohayon M, Neuman H, Koren O. 2016. Microbial changes during pregnancy, birth, and infancy[J]. Frontiers in Microbiology, 7: 1031. DOI: 10.3389/fmicb.2016.01031. Pedersen AB, Davies TJ. 2009. Cross-species pathogen transmission and disease emergence in primates[J]. Ecohealth, 6(4): 496-508. Price MN, Dehal PS, Arkin AP. 2009. FastTree: computing large minimum evolution trees with profiles instead of a distance matrix[J]. Molecular Biology and Evolution, 26(7): 1641-1650. Quast C, Pruesse E, Yilmaz P, et al. 2013. The SILVA ribosomal RNA gene database project: improved data processing and web-based tools[J]. Nucleic Acids Research, 41(D1): D590-D596. Russell JB, Baldwin RL. 1979. Comparison of maintenance energy expenditures and growth yields among several rumen bacteria grown on continuous culture[J]. Applied and Environmental Microbiology, 37(3): 537-543. Schloss PD, Westcott SL, Ryabin T, et al. 2009. Introducing mothur: open-source, platform-independent, community-supported software for describing and comparing microbial communities[J]. Applied and Environmental Microbiology, 75(23): 7537-7541. Schwan TG. 1996. Ticks and Borrelia: model systems for investigating pathogen-arthropod interactions[J]. Infectious Agents and Disease, 5(3): 167-181. Segata N, Izard J, Waldron L, et al. 2011. Metagenomic biomarker discovery and explanation[J]. Genome Biology, 12(6): R60. Sievers F, Wilm A, Dineen D, et al. 2011. Fast, scalable generation of high-quality protein multiple sequence alignments using Clustal Omega[J]. Molecular Systems Biology, 7(1): 539. Sun B, Wang X, Sofi B, et al. 2016. Marked variation between winter and spring gut microbiota in free-ranging Tibetan Macaques (Macaca thibetana)[J]. Scientific Reports, 6: 26035. DOI: 10.1038/srep26035. Uenishi G, Fujita S, Ohashi G, et al. 2007. Molecular analyses of the intestinal microbiota of chimpanzees in the wild and in captivity[J]. American Journal of Primatology, 69(4): 367-376. Vaishampayan PA, Kuehl JV, Froula JL, et al. 2010. Comparative metagenomics and population dynamics of the gut microbiota in mother and infant[J]. Genome Biology and Evolution, 2(1): 53-66. Wang W, Cao J, Li JR, et al. 2016. Comparative analysis of the gastrointestinal microbial communities of bar-headed goose (Anser indicus) in different breeding patterns by high-throughput sequencing[J]. Microbiological Research, 182: 59-67. Yasuda K, Oh K, Ren B, et al. 2015. Biogeography of the intestinal mucosal and lumenal microbiome in the rhesus macaque[J]. Cell Host & Microbe, 17(3): 385-391. Zhao J, Yao Y, Li D, et al. 2018. Characterization of the gut microbiota in six geographical populations of chinese rhesus macaques (Macaca mulatta), implying an adaptation to high-altitude environment[J]. Microbial Ecology, 76(2): 565-577. Zhao QK. 1994. A study on semi-commensalism of Tibetan Macaques at Mt. Emei, China[J].Revue D Ecologie-La Terre Et La Vie, 49(3): 259-271. Zhao QK. 1997. Intergroup interactions in Tibetan macaques at Mt. Emei, China[J]. American Journal of Physical Anthropology, 104(4): 459-470. Zhao QK, Deng ZY, Xu JM. 1991. 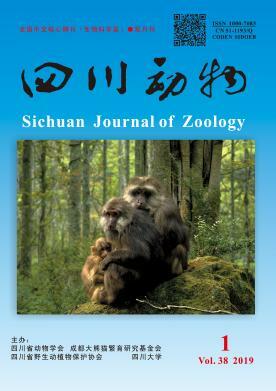 Natural foods and their ecological implications for Macaca thibetana at Mount Emei, China[J]. Folia Primatologica, 57(1): 1-15.